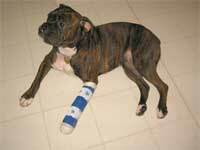 Bell had been hobbling around for a couple of days. We thought maybe she'd jammed it running around, but the vet says it's an infection. Unclear if it's related to the cracked toenail she recently had removed (cauterized), but it's the same foot. She has to wear this splint for a week, and she's on antibiotics. The splint can't be allowed to get wet, so we have to tie on a thick plastic bag for trips outside. Click picture to enlarge. Click here for movie.